A few months ago I shared the My Little Pony Cake I made for Aurelia’s third birthday. Sure it was adorable, but I had no idea it would become one of my most popular posts! 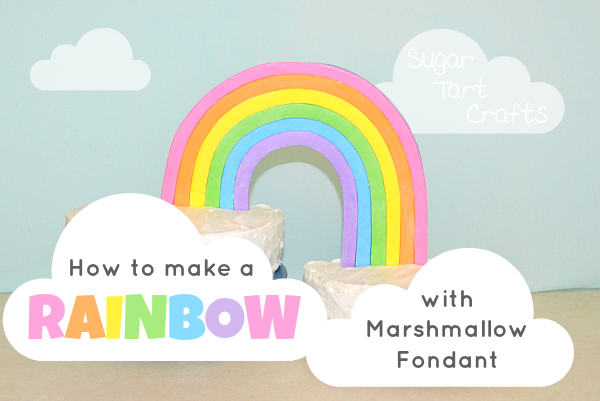 Since then I’ve received quite a few e-mails asking me how I made the rainbow, and I was so glad to find that I had just enough marshmallow fondant leftover from Morgan’s Candy Shop Cake to finally make a tutorial. 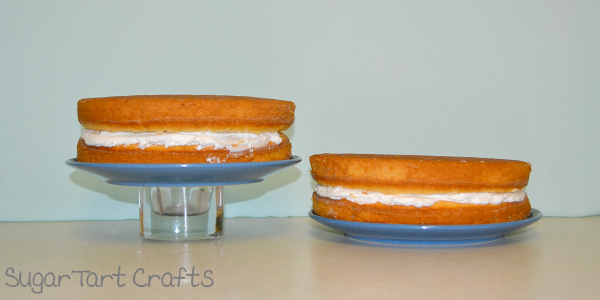 First, choose your cake plates, and determine the height difference that you like best. Yep. I’m totally going with a tealight holder and some salad plates, cuz I’m fancy like that. 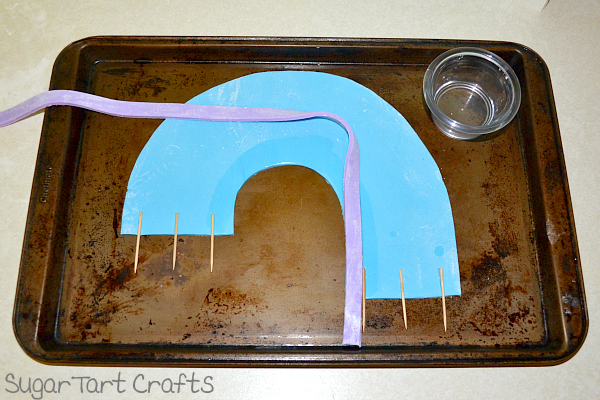 ;D You could easily make a rainbow that is level on both sides, but either way, it is important that you do this at least a few days in advance to give the fondant an adequate amount of time to dry. I find it easiest to bake my cakes, and wrap them tightly in plastic wrap once they’ve cooled. Then you can stack the layers to help determine the height you’ll need for the rainbow, and just pop them into the freezer until everything is ready to be assembled. This won’t affect the taste of the cake. Simply leave them set on the counter wrapped in the plastic until they are fully defrosted. Then you can unwrap and frost them as normal. 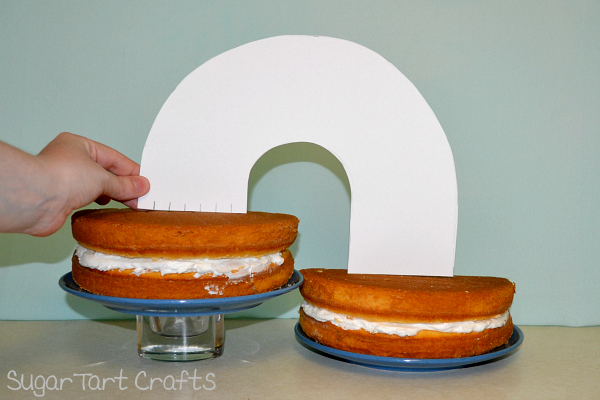 Once you have your cakes stacked, hold a piece of paper behind both cakes, level with the top of the lower one. 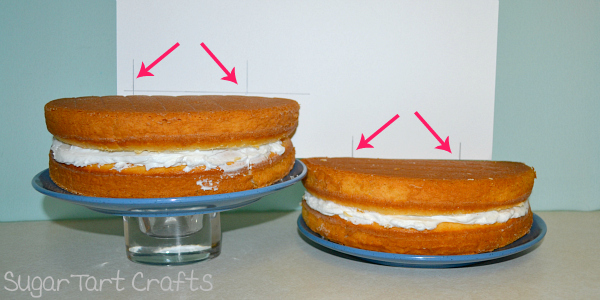 Draw a line to mark the top of the higher cake. This line will be one end of the rainbow, and the bottom edge of the paper will be the other. 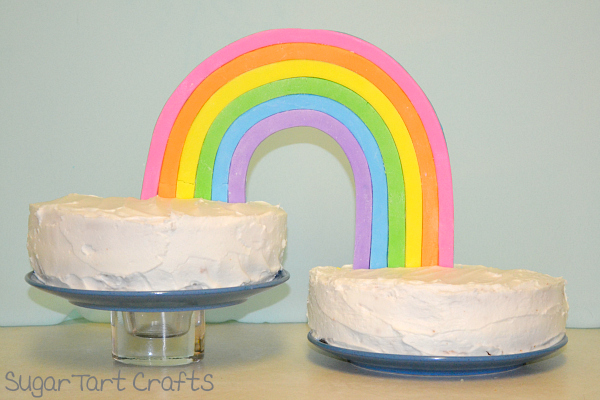 Next, mark two vertical lines on each level to show approximately where you want the rainbow to touch the cake. 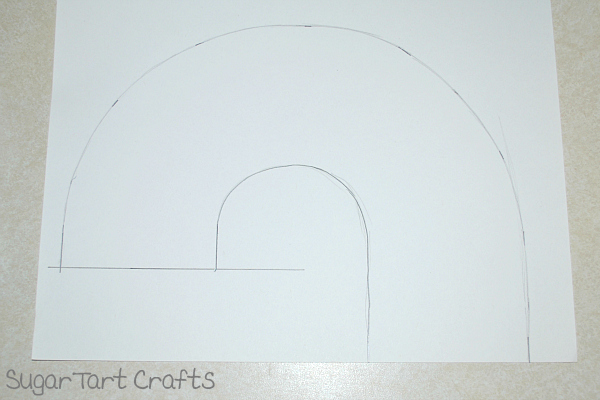 Connect the inner two vertical marks with a curved line, forming the underside of the rainbow. Then measure from this line out to the outside vertical marks. Adjust those marks so that both ends are the same width apart, and connect them with a second curved line. 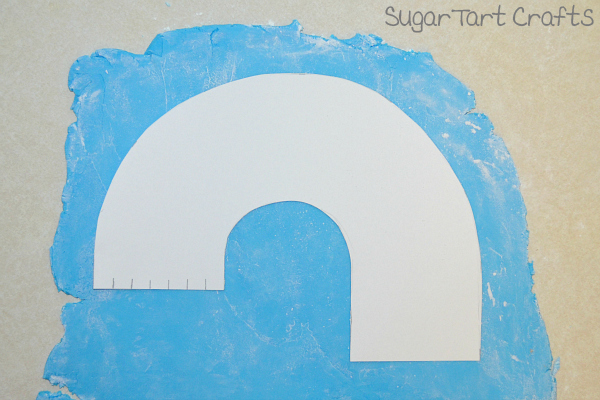 Make sure the two lines are the same width apart around the entire curve. Make it easier: The width of your rainbow should be easily divided by the number of colors you plan to use. ex. For a 3 inch wide rainbow made with 6 colors, each stripe would be 1/2 in wide. Easy peasy. 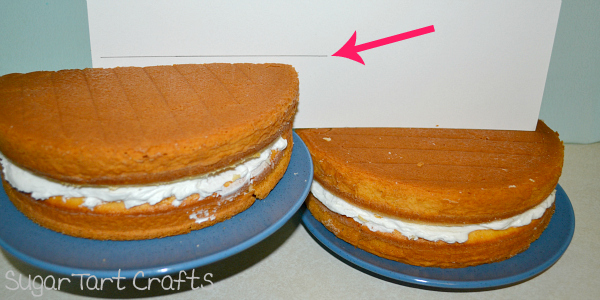 Cut out your new template, and test it against the cake to make sure you are happy with the size and shape. We’re done with the cakes at this point, so you can freeze them now if you plan to. Roll out a bit of fondant, and use your template to cut out a base layer for the rainbow. Move your base to a stable surface like a cookie sheet where it will be able to rest safely while it drys. Yes, my sheet is gross, but I promise it’s clean! Press a few sturdy toothpicks into both lower edges of the base. Press them into the fondant firmly, but be careful not to push them so hard that they come out the other side. 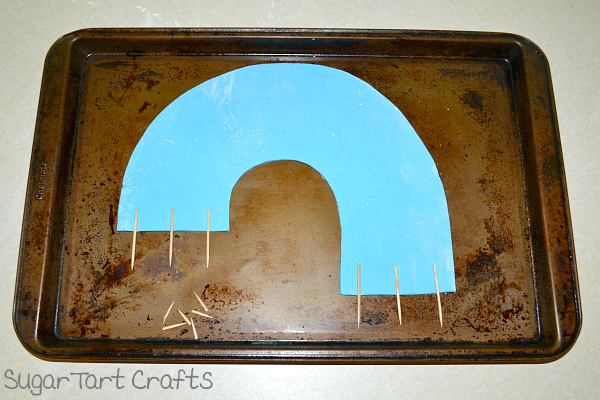 This will help anchor the rainbow to the cake when you are ready to stand it up. 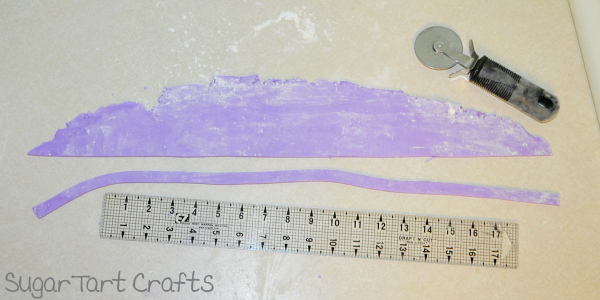 Roll out the color fondant you plan to use for the inner most stripe, and cut it into a long strip. Use the width measurement from above divided by the number of colors to determine the width of you strips. Apply a dab of water along the bottom edge of the base, and carefully glue the colored strip in place. Be sure to use only a tiny drip of water, since too much will actually “melt” the fondant. Carefully trim off the ends, and continue adding strips of the remaining colors side by side until you reach the top of the base. Set the pan aside, and allow the rainbow to dry. This could take a few days depending on the humidity in your area. Once the rainbow has hardened simply frost your cakes as normal, and press the toothpicks down into the cakes. Ta Da! A magical rainbow perfect for fairies, My Little Ponies, Care Bears, or whatever other cuteness you’ve got. Enjoy! Your skills in the kitchen amaze me, everything you bake is adorable! How adorable, what a cute idea!!! The rainbow looks awesome, beautifully made! What a fun cake idea! Thanks Maria! It's actually a lot of fun letting a little kid design their own cake. They've got the most interesting ideas! 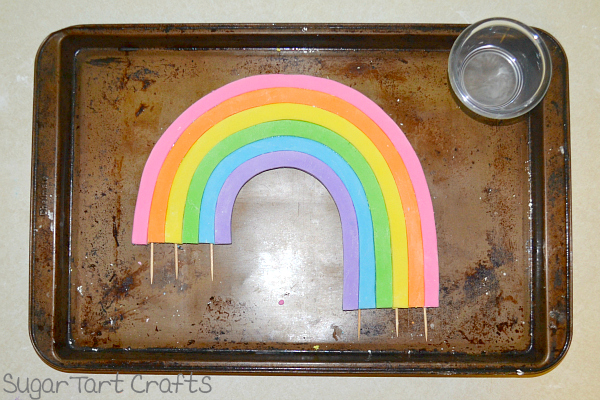 cute rainbow, and very easy tutorial. I love working with fondant as well. Hi Stephanie! It's so fun trying shape fun little things out of sugar isn't it? Hi Jennifer! This cake does seem to have a special place with little girls I know. Thanks for the invite! This rainbow is adorable. I’m amazed it stays up though?! I’m new to the world of fondant and I was considering making a rainbow for a Puffin Rock themed cake. It looks like a lot of fun but a bit tricky as well.